You can estimate standard errors and confidence intervals of a population parameter such as the mean, median, proportion, odds ratio, correlation coefficient, regression coefficient and more. Test the stability of analytical models and procedures found throughout the IBM SPSS Statistics product family, including descriptive, means, crosstabs, correlations, regression and many others. You can modify number of samples upward or downward. The default setting is 1000 samples. Through resampling, SPSS Bootstrapping can create thousands of alternate versions of your dataset, providing a more accurate view of what is likely to exist in the population. 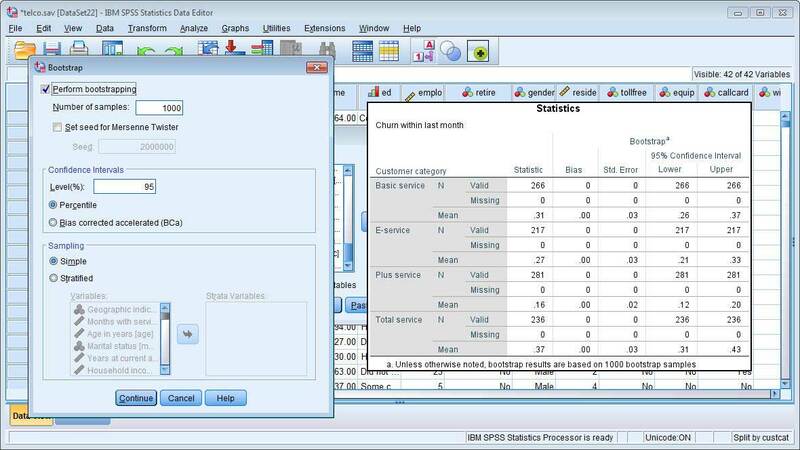 IBM SPSS Bootstrapping requires a valid IBM SPSS Statistics Base license.